Unlike what we have said about various civilizations of the Bronze Age, in Greece the practice of burying horse bits in graves was rare. Because of this, not many specimens have been preserved. For instance, those relating to the period between the eighth and seventh centuries BC, are almost entirely missing and historians have tried to reconstruct the variety of instruments used in ancient times in Greece, mainly from vase paintings. These, however, are too stylized to allow reliable analysis. However, we know that before the invasion of the Celts from Central Europe in the third century BC, in Greece only snaffle bits were used. In the Bronze Age and in the early Iron Age, the use of chariots in Greece prevailed above horseback riding. During this time, it is believed that horses were controlled with a type of cavesson, or with snaffle bits (rigid or jointed) with sidebars. These bits acted partly through the mouthpieces and partly through the pressure of the sidebars on the sides of the animal’s mouth. In the following classical period, roughly between the fifth and fourth centuries BC, when riding began to prevail over the driving of chariots, the use of different bits with very severe mouthpieces, spread. On the cannons of the bits spikes were added that, while not changing the operating principle of the snaffle bit, made their action on the bars much more effective. There is no doubt that these types of mouthpieces frequently hurt the horses mouth. In this regard, the historian and rhetorician Dio Chrysostom, who lived between I and II sec. AD, in his Discourses (LXIII, 5), tells an anecdote about the famous Greek painter Apelles (IV sec. BC) who, not succeeding in his attempts to portray realistically the mouth of a horse covered with foam and blood, threw a sponge against the painting thus finally achieving the desired result. It is precisely because of the extreme severity of the mouthpieces in use in his time, that Xenophon in his treatise on the Art of Riding, argues that «smooth bits are better than the rough ones, but if you put the horse a rough bit, you have to make it similar to a smooth one through the lightness of the hand »(Perì Hippikès, IX, 9). Xenophon also argues that «we need to have at least two bits. Of these, one should be smooth, having discs of a fair size, the other should have the disks heavy and thick and the spikes sharp, so that when the horse takes hold of it he may be repulsed by its roughness into letting it go, and when instead of it he has the smooth one in his mouth, he may be pleased by its smoothness and perform in it all those exercises that were taught by the rough one» (Perì Hippikès, X, 6). The author does not provide a detailed description of these bits, taking for granted the knowledge on the part of the reader. However, he dwells on the mouthpieces, specifying that if the horse has a tendency to lean on the bit, it is appropriate to use one with large internal disks, requiring the animal to keep his mouth open. Similarly he prefers jointed bits with respect to the stiff ones, because it is more difficult for the horse to lean on them and resist to their action. Among the different kinds of bits that have been identified in classical Greece, one is particularly typical. 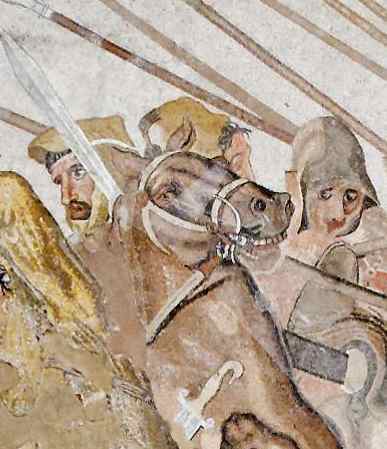 It may be seen in the famous Mosaic of Alexander, found in the House of the Faun in Pompeii, depicting the Battle of Issus, which opposed the Macedonian leader to Darius III of Persia (in 333 BC). It is distinguished by showy cheekpieces in the form of S. The ends of which are bent, one horizontally inwards, the other outwards. The inward turning end probably went under the chin of the horse. The mouthpiece was particularly severe and consisted of two jointed cannons on which pivoted two rollers bristling with spikes (echinoi), designed to act on the bars of the mouth, and two disks (trochoi), acting on the tongue and on the palate, to prevent the horse from closing his mouth and resisting the action of the bit. From the juction rings (sumbolai) of the cannons, hung a short length of fine chain that stimulated the tongue of the animal. It was used to encourage the mobility of the jaw and salivation.The straps of the bridle were attached to the four rings on the cheekpieces, while the reins were attached to characteristic hooks, rotating freely around the ends of the cannons. Some bits with S-shaped cheekpieces are already represented in Assyrian bas-reliefs of the mid-seventh century BC. 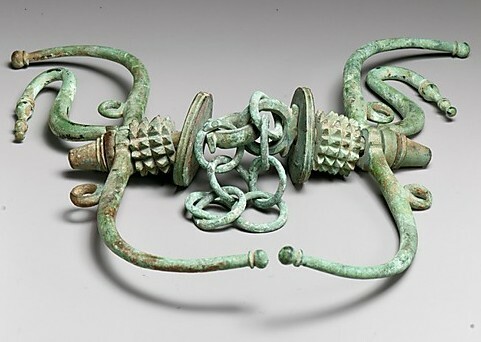 Cheekpieces of similar shape, but made of wood and with ends carved in the form of animal heads (dated between the fifth and the fourth centuries BC. ), were also found in the burial mounds of Pazyryk, in the Altai Mountains in Siberia. On the basis of the painting found on vessels, it is believed that this kind of bit was introduced by the Corinthians and then quickly spread throughout Greece. On the other hand, the legend of the divine bit that Bellerophon use to tame Pegasus, is particularly attached to Corinth and the same Pindar supports the tradition that places the invention of the first bit in this city. ANDERSON, John Kinloch , Ancient Greek Horsemanship, Berkley & Los Angeles, University of California Press, 1961. BUGH, Glenn Richard, The Horsemen of Athens, Princeton, Princeton University Press, 1988. GAEBEL, Robert E., Cavalry Operations in the Ancient Greek World, Norman, University of Oklahoma Press, 2002. SENOFONTE, L’arte della cavalleria. Il manuale del comandante della cavalleria, a cura di G. Cascarino, Rimini, Il Cerchio, 2007. SESTILI, Antonio, L’equitazione nella Grecia antica. I trattati equestri di Senofonte e i frammenti di Simone, Firenze, Atheneum, 2006. SPENCE, Iain G., The cavalry of Classical Greece. A social and military history, Oxford,Oxford University Press, 1993 . WORLEY, Leslie J., Hippeis: The Cavalry of Ancient Greece, Boulder and Oxford, Westview Press, 1994.
exceptional analysis of the way the ancient greek bit worked! I believe that this kind of bits had sasanian-persian influence. 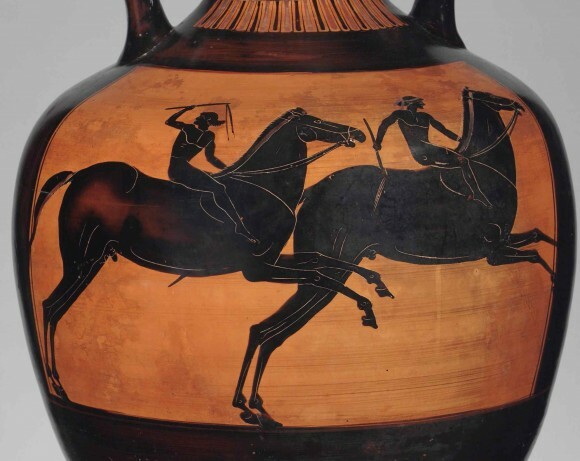 What realy impresses me is that the head carriage of the ancient greek horses is exceptional, reminds the modern ackal teke head carriage. The bits were not only respobsible for this head carriage. The breed had a lot to do ,also . Congratulations.